During DNA and RNA shearing, DNA molecules are broken into smaller pieces. DNA / RNA fragmentation is one of the important sample prep steps required create libraries for next generation sequencing (NGS). 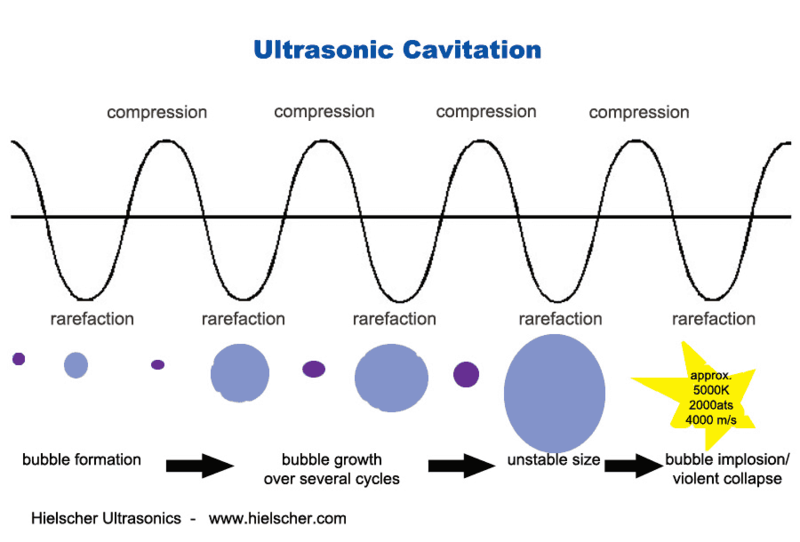 Ultrasonic DNA shearing uses the forces of acoustic cavitation to break the DNA or RNA into pieces of 100 – 5kb bp. Ultrasonic shearing allows for precise DNA fragmentation and adaption to the desired DNA length. 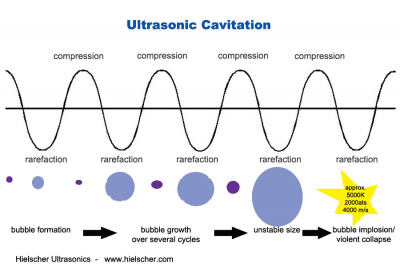 Hielscher Ultrasonics offers various ultrasound-based solutions for DNA, RNA and chromatin shearing. Choose between a probe-type ultrasonicators (e.g. 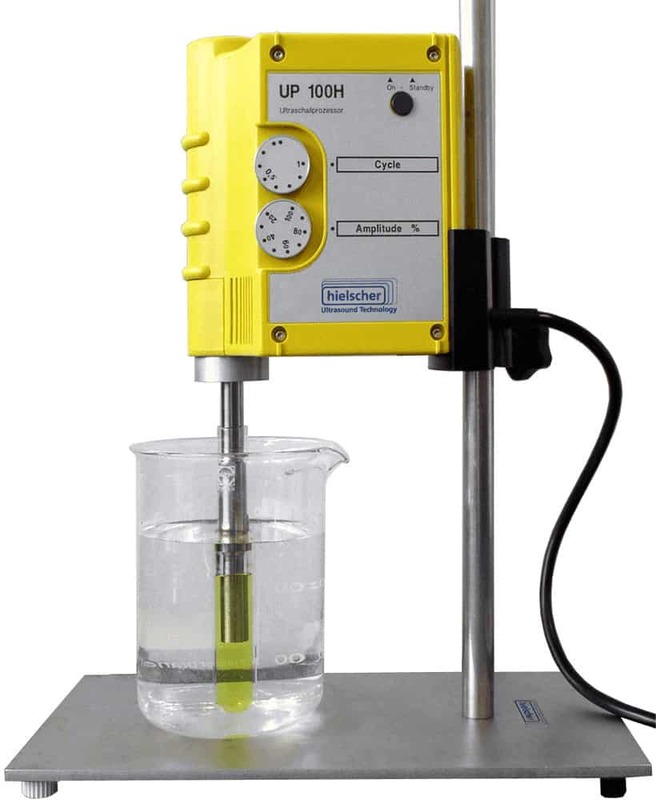 UP100H) for direct sonication using a microtip, or use the VialTweeeter or the ultrasonic cuphorn for indirect DNA preparation of various samples simultaneously. 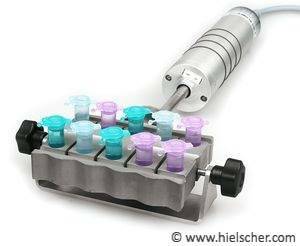 Hielscher offers the ideal device considering your needs: wether you have 1 or up to 10 samples, volumes from microliter to liter volumes – Hielscher ultrasonic processors are available to meet your requirements to prepare DNA, RNA and chromatin fragments at the right length. Reproducibility, easy operation and precise control allow for a reliable library for next-generation sequencing. In contrast to enzymatic DNA fragmentation, ultrasonic shearing applies pure mechanical shear forces without adding any chemicals. By the precise setting of process parameters, ultrasonic shearing produces high molecular weight DNA fragments (plasmid and genomic DNA). Purified nucleic acids can be amplified prior to or after a fragmentation step. 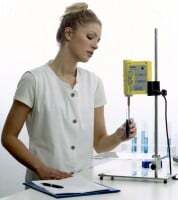 Sonication parameters (power, pulse cycle / bursts, time and temperature) can be controlled safely via software settings. 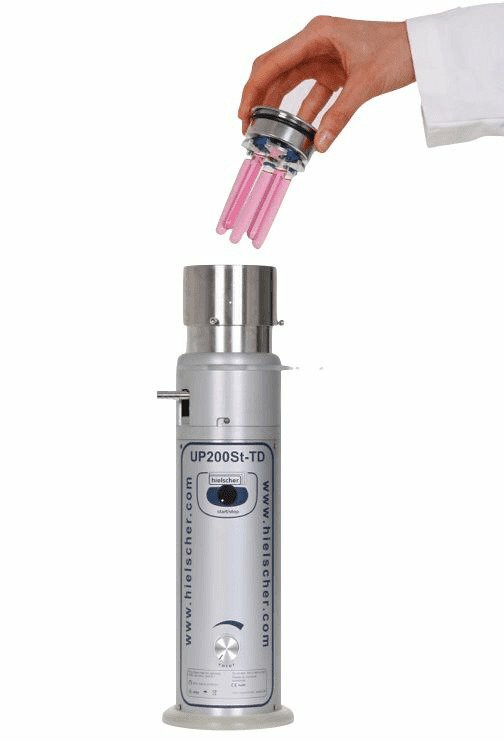 Bacterial pellets suspended in PBS to the desired final concentration were treated with ultrasound disruptor UP100H (Hielscher GmbH, Germany) equipped with a microtip MS1 (1mm in diameter). 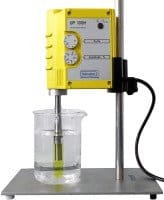 The operating frequency was 30 kHz and effective output power was 100 W. During the operation, samples were cooled in an ice-water bath, mixed and centrifuged. 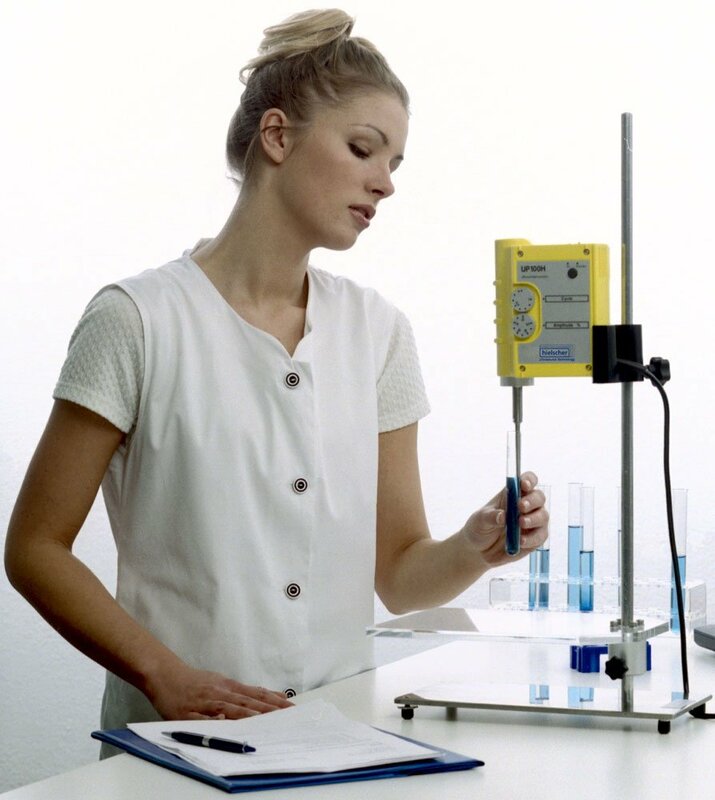 The samples were utilized for flow cytometry studies, while for later handling, samples were subjected to a heat treatment (95°C, 5 min). The crude cell lysates were processed with a mixture of phenol:chloroform:isoamyl alcohol (25:24:1). An equal volume of this mix was added to the lysate sample, the solution was vortexed vigorously for 15 s and centrifuged at 15,000 x g for 2 min at room temperature (RT) around 22°C. The top aqueous phase containing the genomic DNA was carefully separated and collected in a new sterile Eppendorf tube. Subsequently, samples were sonicated to fragment the DNA. The sonication step was realized in the same conditions as described above. To evaluate the fragmentation effects on the genomic DNA, samples were analyzed by using agarose gel electrophoresis. Basselet P., Wegrzyn G., Enfors S.-O., Gabig-Ciminska M. (2008): Sample processing for DNA chip array-based analysis of enterohemorrhagic Escherichia coli (EHEC). Microbial Cell Factories 7:29. 2008. Doublier S., Riganti Ch., Voena C., Costamagna C., Aldieri E., Pescarmona G., Ghigo D., Bosia A. (008): RhoA Silencing Reverts the Resistance to Doxorubicin in Human Colon Cancer Cells. 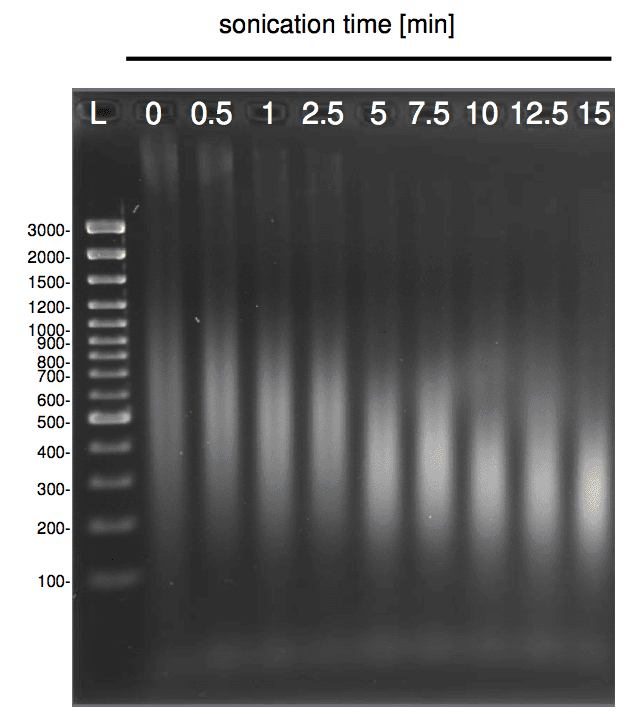 Molecular Cancer Research 6(10), 2008. Fredlund E., Gidlund A., Olsen M., Börjesson T., Spliid N.H.H., Simonsson M. (2008): Method evaluation of Fusarium DNA extraction from mycelia and wheat for down-stream real-time PCR quantification and correlation to mycotoxin levels. Journal of Microbiological Methods 2008. Fritsche C., Sitz M., Weiland N., Breitling R., Pohl H.-D. (2007): Characterization of the growth behavior of Leishmania tarentolae – a new expression system for recombinant proteins. Journal of Basic Microbiology 47, 2007. 384–393. Ristola M., Arpiainen S., Saleem M. A., Mathieson P. W., Welsh G. I., Lehtonen S., Holthöfer H. (2009): Regulation of Neph3 gene in podocytes – key roles of transcription factors NF-κB and Sp1. BMC Molecular Biology 10:83, 2009. Rodriguez J., Vives L., Jorda M., Morales C., Munoz M., Vendrell E., Peinado M. A. (2008): Genome-wide tracking of unmethylated DNA Alu repeats in normal and cancer cells. Nucleic Acids Research Vol. 36, No. 3, 2008. 770-784. Weiske J. Huber O. (2006): The Histidine Triad Protein Hint1 Triggers Apoptosis Independent of Its Enzymatic Activity. The Journal of Biological chemistry. Vol. 281, No. 37, 2006. 27356–27366.